Shopping for a new GMC Canyon? 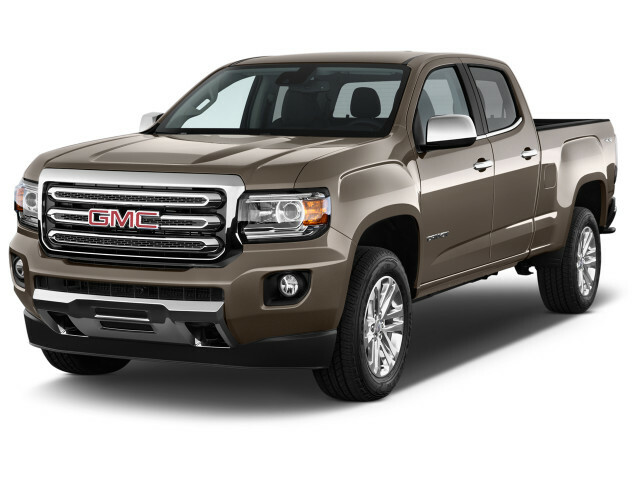 A well-optioned GMC Canyon SLT approaches the Canyon Denali for less coin, so shop carefully. The 2018 GMC Canyon is a solid, highly recommended choice among mid-size pickups for its terrific powertrains, comfortable interior, and refined demeanor. The 2018 GMC Canyon is a mid-size pickup that shines up pretty well. 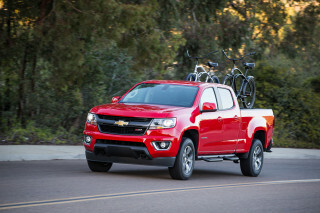 Like its Chevrolet Colorado kissing cousin, the 2018 Canyon is on the small end for a pickup. But at nearly 19 feet from bumper-to-bumper in its largest configuration, the Canyon is no pint-sized cargo hauler. It’s available in a wide range of trim levels suitable for just about every need—SL, base, SLE, All Terrain, SLT, and Denali. The All Terrain trim spruces the Canyon up for moderate four-wheeling, but there is no equivalent to the bonkers Colorado ZR2. This year, the Canyon lineup sees few changes. 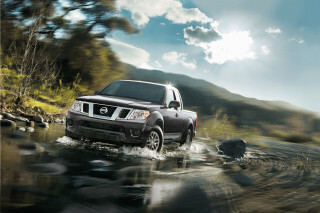 Leather upholstery is a new option with the All Terrain package and all models gain a windshield washer fluid sensor. The Canyon can be specified with either extended- or crew-cab bodies, the latter offering decent but not exactly stellar room for a full complement of adults. 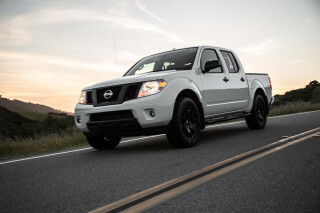 Crew cabs are available with either a 5-foot-2 or a 6-foot-2 bed; extended cabs offer only the latter. Depending on the trim level, Canyons can be ordered with either 2.5-liter inline-4 or 3.6-liter V-6 gas engines or a turbodiesel 2.8-liter inline-4. A 6-speed manual is standard with the inline-4 on some models. A 6-speed automatic is optional with either 4-cylinder and a high-tech 8-speed automatic is included with the V-6. Both rear- and four-wheel drive Canyons are available. Four-by-fours come standard with a convenient automatic four-wheel-drive mode suitable for use on any terrain, unlike some rivals with off-road-only systems. While not a corner carver, the Canyon is composed and quiet on-road and delivers up to 30 mpg on the highway when configured just right. Turbodiesels are rated to tow up to 7,700 pounds, making these trucks suitable haulers for most daily uses. The Canyon primarily differs from the Colorado in the way its trim levels are organized. If you’re leaning toward either of these trucks, it’s worth shopping them back to back to see which one offers the better value. 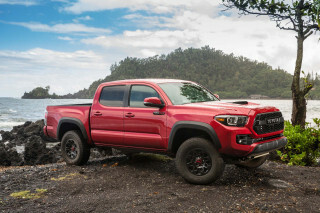 They skew separately at the top end, however, where the Colorado ZR2 is for serious off-road use and the Canyon Denali piles on surprising luxuries. No matter how you slice your Canyon, these mid-size trucks are a smart buy. The 2018 GMC Canyon’s classic looks are the pickup equivalent of a ruggedly handsome three-day beard. Up front, the Sierra’s tall grille and boxy shapes impart a timeless, classic approach compared to the swoopier style of the Chevy Colorado that rolls off the same assembly line. From the side, the two are basically identical, although we like the Canyon’s slightly more pronounced wheel arch flaring. A belt line that rises upward toward the rearmost roof pillar adds a car-like softness, but keep your eyes moving toward the bed and there’s no question what these machines were built to do: haul. 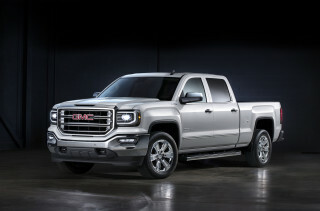 GMC offers the Canyon in extended- and crew-cab configurations. The extended cab has rear-hinged back doors that offer access for loading gear and smaller folk into the rear seating area. Crew cabs are basically SUVs with a bed, with big front-hinged rear doors. Extended cabs only come with a 6-foot-2 bed, while crew cabs are available with that setup or a bed that’s a foot shorter. Inside, a curvy dashboard puts most controls up high. Work-oriented Canyon SLs aren’t exactly showy, but the range-topping Denali has nice fake wood and plenty of French stitched details. The 2018 GMC Canyon has good optional engines and a solid set of gearboxes. 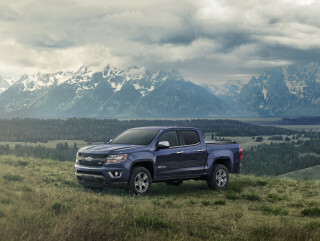 If you’ve been keeping tabs, you’ll note that the nearly identical Chevrolet Colorado rates 7 out of 10. That’s because the bowtie brand’s truck is now offered with serious off-road hardware in the ZR2, something the GMC lacks. Instead, the Canyon shoots a little more upscale and mostly hits. Standard on extended cabs is a 2.5-liter inline-4 rated at 200 horsepower and 191 pound-feet of torque. It’s mated to a 6-speed manual transmission with rear-wheel drive. A 6-speed automatic is optional with rear-drive and mandatory on four-wheel-drive models. A 3.6-liter V-6 with 308 hp and 275 lb-ft is optional on extended cabs and standard otherwise. It’s the engine you’re far more likely to find on dealer lots and it’s a winner. While the inline-4 provides decent enough thrust around town and pairs well to the standard manual transmission, the V-6 is smoother and far more robust in any situation. It’s well-suited to its 8-speed automatic, which fires off quick, clean shifts. 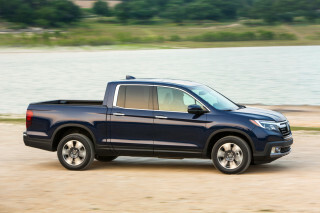 Optional on higher-trim Canyons is a 2.8-liter turbodiesel inline-4 rated at 186 hp and 369 lb-ft. Paired to a 6-speed automatic, the turbodiesel is an impressive, refined performer with plenty of low-down torque for towing and only a hint of lag right off the line. 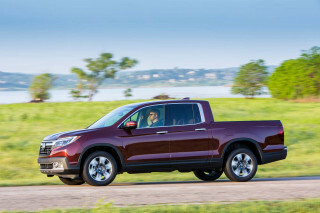 With the diesel, the Canyon is rated to tow up to 7,700 pounds properly optioned. Gas V-6 models aren’t that far behind with their 7,000-pound rating, but they don’t feel nearly as confident and unflustered as the turbodiesel. If you’re going to venture off-road, opt for the All Terrain X package over the less costly All Terrain. It brings a few styling bits to the party but it also includes beefy Goodyear all-terrain rubber. You’ll know the package was worth the coin the first time you crawl over a rock. Four-wheel-drive Canyons include an upmarket transfer case that includes a convenient automatic mode suitable for use on any road. Rivals use part-time systems that must be disengaged on dry pavement. Though the 2018 GMC Canyon’s second row is tight regardless of body size, the interior is well-finished and can be almost luxurious in the Denali trim. Canyon SLs are aimed mainly at fleet buyers, so they’re pretty sparse inside with their hose-out vinyl seats and flooring. Base Canyons and SLEs shoot a little higher with fabric upholstery, while SLT and Denali trims are outfitted in swankier leather. Although the Canyon Denali has some nice finishes, it comes up short in terms of added content. All Canyons we’ve driven have felt carefully assembled with nicely grained finishes and soft touch surfaces scattered about. Up front, they’re comfortable, with a power driver’s seat standard even on Canyon SLs. The rear seat in extended cabs is predictably tight and is best suited as secondary storage. Crew cabs offer far better space, although an upright seat back makes them not suitable for long-distance comfort. Two bed lengths are on offer, a 6-foot-2 that’s standard with the extended cab and optional on the crew cab and a 5-foot-2 that comes standard on the crew cab. Either way, the Canyon is certainly more mid-size than compact, unlike small pickups of yore. So-so safety scores and a lack of advanced tech don’t help the 2018 GMC Canyon. All models come standard with anti-lock brakes, six airbags, and a rearview camera. The Driver Alert Package optional on SLEs and SLTs and standard on Denalis includes forward-collision and lane-departure warnings, but it cannot automatically apply the brakes. In terms of crash-test scores, both body configurations of the Canyon score four stars overall according to the federal government, a figure that factors in a five-star side-impact test but three-star rollover scores. The IIHS found discrepancies in the way the extended and crew cab models fare in a wreck, however. Crew cabs scored “Good” in the IIHS’ full barrage of tests, while extended cabs earned the lesser “Acceptable” score in the small-overlap frontal and side-impact tests. Since there’s no automatic emergency braking on offer, the Canyon lineup doesn’t qualify for a Top Safety Pick award from the IIHS. Even base 2018 GMC Canyons aren’t truly basic, while Denalis could be real luxury trucks. The Canyon SL is the truck you want if a fleet of basic trucks is your goal. It’s not exactly sparse with its standard power driver’s seat, power windows and locks, and 7.0-inch infotainment screen with Apple CarPlay and Android Auto compatibility. However, it’s only offered as an extended cab and only with vinyl seats and rear-wheel drive. The base Canyon, despite its lack of additional nomenclature, is basically the same thing as the SL—except with cloth upholstery. It’s also available with four-wheel drive and the V-6 engine for an extra cost. Most consumers will probably start at the Canyon SLE, which adds an 8.0-inch infotainment screen that can be upgraded with navigation, alloy wheels, a leather-wrapped steering wheel, and a few other creature comforts. Several option packages are available with goodies such as heated seats, skid plates, and more. The Canyon All Terrain starts with the SLE and adds an off-road suspension, skid plates, recovery hooks, and some styling goodies. For just a bit more, an X package includes a spray-in bedliner, Goodyear all-terrain tires, and side steps. Leather is newly available on the Canyon All Terrain. From there, the Canyon SLT comes standard with leather upholstery, 18-inch alloy wheels, a power passenger’s seat, and remote start. Topping the lineup is the Canyon Denali with its ventilated front seats, Bose audio, navigation, forward collision warnings, heated steering wheel, and 20-inch wheels. It’s not quite a pickup by Bentley, but it’s surprisingly decadent for the money. For a pickup, the 2018 GMC Canyon can be extremely fuel-efficient if you pick the right options. The 2018 GMC Canyon is certainly thriftier than the average mid-size pickup. And if you order all the right options, it’s thriftier than some mid-size sedans. Let’s start at the bottom with the base 2.5-liter inline-4. Rear-wheel-drive models earn 20 mpg city, 26 highway, 22 combined with either the manual or automatic transmission. Pick four-wheel drive and those figures slide slightly to 19/24/21 mpg with the mandatory automatic. The Canyon’s available 3.6-liter V-6 is the thirstiest of the lineup. With rear-wheel drive, the V-6 earns 18/25/20 mpg. Four-by-four models come in at 17/24/19 mpg. The miser of the group is certainly the turbodiesel, although you’ll have to do the math to see if the extra cost for the engine pays out over time. With rear-drive, the turbodiesel is rated at 22/30/25 mpg. Four-wheel drive drops that to 20/28/23 mpg. Looking for a different year of the GMC Canyon?